Pterocephalus depressus also known as the Moroccan pincushion flower is a groundcover. That is the simple description. This is not like a normal groundcover – this is the groundcover that will grow in your really tough garden situations and does some wonderful things in even a standard landscape. Currently this plant is taxonomically a bit of a conundrum, but don’t let that scare you off. While the scientists try figure out what to call it, Moroccan pincushion flower will be blooming its way into your heart. The intricate and lacy texture of the foliage is evergreen and draws interest to your garden all year long. The flowers are a dusty pink and bring a kaleidoscope of butterflies from miles around. As the flowers begin to fade and transition into the seed bearing stage the plant transforms again and gives another intriguing look. The seed heads hover over the top of the intricate grey mats like willow-the-wisps beckoning you in and transporting you to a wondrous land where all things are garden. A fun way to grow and display this plant is to let it grow in a garden spot where it will crawl over and swallow rocks and run through the crevices between larger rocks. 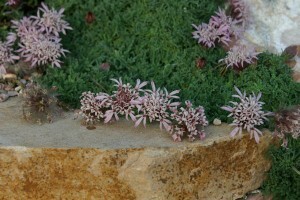 This wonderful perennial is a superb choice for anyone with a rock garden, xeriscape, or a crevice garden. Will this plant grow surrounded by mulch, or does it need the rock to enable it to spread? I will grow with smaller wood mulch around it, but it really like small gravel mulch. Great Plant!